Guess what ? 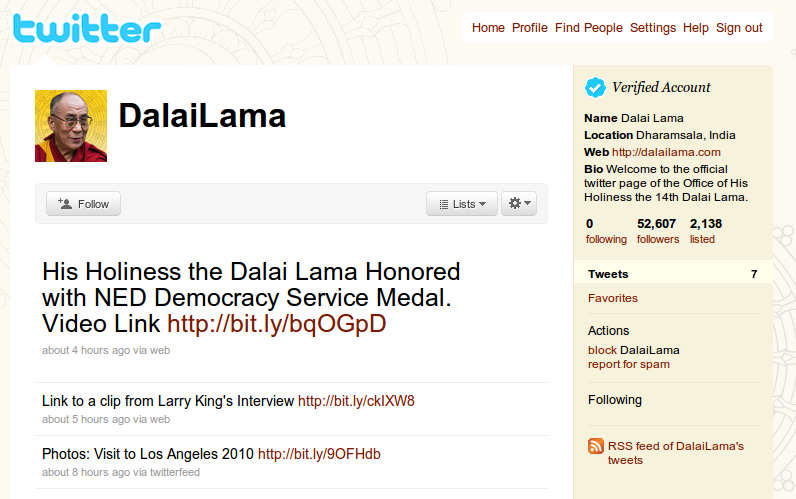 His Holiness, the 14th Dalai Lama of Tibet has joined the world's favorite micro-blogging website - Twitter. He, Tenzin Gyatso, (born: Lhamo Thondup) is the head of the Tibetan government-in-exile based in Dharamshala, India. Tibetans traditionally believe him to be the reincarnation of his predecessors. He fled from Tibet after a failed uprising against the Chinese rule in 1959 and is now based in India. He received the Nobel Peace Prize in the year 1989. On Tuesday, a post on the website of the Tibetan government-in-exile said - "His Holiness the Dalai Lama has joined the social networking line(Twitter) to keep in touch with his followers." . He holds a verified account on Twitter and his follower count has already crossed the 50k mark. Check out Dalai Lama's twitter page here.